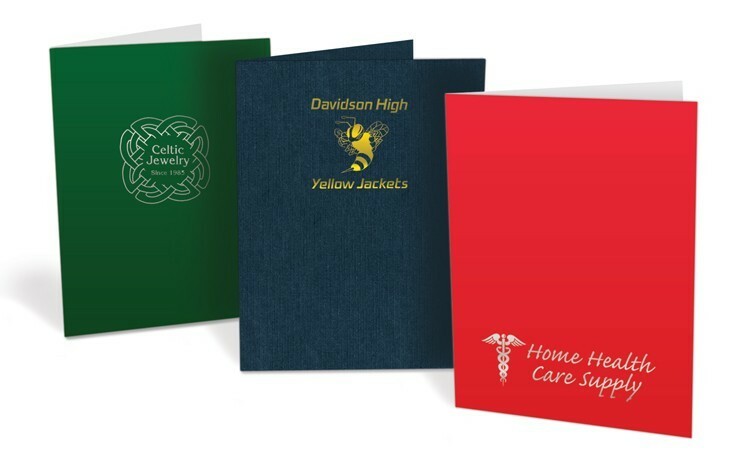 9" x 12" USA Made Presentation Folders with a one color foil hot-stamp available in Standard White Stock and select Classic and Designer paper stocks (see prices) with 4” inside pockets with business card slits on the right pocket. Prices include a one color foil hot-stamp in a 3” x 5” area or up to a 15 square inch area. Embosssing and Soft-Touch finish available on Standard White and Classic Papers, call for details. Ink printed, Foil Stamped, Budget, Legal Size, Mini Size, Stock Design and "Splash" style Folders are also available, see other styles. IMPRINT: 3" x 5" or up to 15 sq. inches on the front cover in top, center or bottom location. IMPRINT COLORS: 1 color metallic foil-stamped in your choice of Bright Gold, Bright Silver, Royal Blue, Red, Green, Non-Metallic White or Black.